“You seek Jesus of Nazareth, who was crucified. He has risen, he is not here” (Mk 16:6). With these words, God’s messenger, robed in light, spoke to the women who were looking for the body of Jesus in the tomb. But the Evangelist says the same thing to us on this holy night: Jesus is not a character from the past. He lives, and he walks before us as one who is alive, he calls us to follow him, the living one, and in this way to discover for ourselves too the path of life. “He has risen, he is not here.” When Jesus spoke for the first time to the disciples about the Cross and the Resurrection, as they were coming down from the Mount of the Transfiguration, they questioned what “rising from the dead” meant (Mk 9:10). 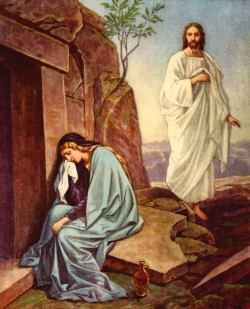 At Easter we rejoice because Christ did not remain in the tomb, his body did not see corruption; he belongs to the world of the living, not to the world of the dead; we rejoice because he is the Alpha and also the Omega, as we proclaim in the rite of the Paschal Candle; he lives not only yesterday, but today and for eternity (cf. Heb 13:8). But somehow the Resurrection is situated so far beyond our horizon, so far outside all our experience that, returning to ourselves, we find ourselves continuing the argument of the disciples: Of what exactly does this “rising” consist? What does it mean for us, for the whole world and the whole of history? A German theologian once said ironically that the miracle of a corpse returning to life – if it really happened, which he did not actually believe – would be ultimately irrelevant precisely because it would not concern us. In fact, if it were simply that somebody was once brought back to life, and no more than that, in what way should this concern us? But the point is that Christ’s Resurrection is something more, something different. If we may borrow the language of the theory of evolution, it is the greatest “mutation”, absolutely the most crucial leap into a totally new dimension that there has ever been in the long history of life and its development: a leap into a completely new order which does concern us, and concerns the whole of history. The discussion, that began with the disciples, would therefore include the following questions: What happened there? What does it mean for us, for the whole world and for me personally? Above all: what happened? Jesus is no longer in the tomb. He is in a totally new life. But how could this happen? What forces were in operation? The crucial point is that this man Jesus was not alone, he was not an “I” closed in upon itself. He was one single reality with the living God, so closely united with him as to form one person with him. He found himself, so to speak, in an embrace with him who is life itself, an embrace not just on the emotional level, but one which included and permeated his being. His own life was not just his own, it was an existential communion with God, a “being taken up” into God, and hence it could not in reality be taken away from him. Out of love, he could allow himself to be killed, but precisely by doing so he broke the definitiveness of death, because in him the definitiveness of life was present. He was one single reality with indestructible life, in such a way that it burst forth anew through death. Let us express the same thing once again from another angle. His death was an act of love. At the Last Supper he anticipated death and transformed it into self-giving. His existential communion with God was concretely an existential communion with God’s love, and this love is the real power against death, it is stronger than death. The Resurrection was like an explosion of light, an explosion of love which dissolved the hitherto indissoluble compenetration of “dying and becoming”. It ushered in a new dimension of being, a new dimension of life in which, in a transformed way, matter too was integrated and through which a new world emerges. It is clear that this event is not just some miracle from the past, the occurrence of which could be ultimately a matter of indifference to us. It is a qualitative leap in the history of “evolution” and of life in general towards a new future life, towards a new world which, starting from Christ, already continuously permeates this world of ours, transforms it and draws it to itself. But how does this happen? How can this event effectively reach me and draw my life upwards towards itself? The answer, perhaps surprising at first but totally real, is: this event comes to me through faith and Baptism. For this reason Baptism is part of the Easter Vigil, as we see clearly in our celebration today, when the sacraments of Christian initiation will be conferred on a group of adults from various countries. Baptism means precisely this, that we are not dealing with an event in the past, but that a qualitative leap in world history comes to me, seizing hold of me in order to draw me on. How can we understand this? I think that what happens in Baptism can be more easily explained for us if we consider the final part of the short spiritual autobiography that Saint Paul gave us in his Letter to the Galatians. Its concluding words contain the heart of this biography: “It is no longer I who live, but Christ who lives in me” (Gal 2:20). I live, but I am no longer I. The “I”, the essential identity of man – of this man, Paul – has been changed. He still exists, and he no longer exists. He has passed through a “not” and he now finds himself continually in this “not”: I, but no longer I. With these words, Paul is not describing some mystical experience which could perhaps have been granted him, and could be of interest to us from a historical point of view, if at all. No, this phrase is an expression of what happened at Baptism. My “I” is taken away from me and is incorporated into a new and greater subject. This means that my “I” is back again, but now transformed, broken up, opened through incorporation into the other, in whom it acquires its new breadth of existence. Paul explains the same thing to us once again from another angle when, in Chapter Three of the Letter to the Galatians, he speaks of the “promise”, saying that it was given to an individual – to one person: to Christ. He alone carries within himself the whole “promise”. But what then happens with us? Paul answers: You have become one in Christ (cf. Gal 3:28). Not just one thing, but one, one only, one single new subject. This liberation of our “I” from its isolation, this finding oneself in a new subject means finding oneself within the vastness of God and being drawn into a life which has now moved out of the context of “dying and becoming”. The great explosion of the Resurrection has seized us in Baptism so as to draw us on. Thus we are associated with a new dimension of life into which, amid the tribulations of our day, we are already in some way introduced. To live one’s own life as a continual entry into this open space: this is the meaning of being baptized, of being Christian. This is the joy of the Easter Vigil. The Resurrection is not a thing of the past, the Resurrection has reached us and seized us. We grasp hold of it, we grasp hold of the risen Lord, and we know that he holds us firmly even when our hands grow weak. We grasp hold of his hand, and thus we also hold on to one another’s hands, and we become one single subject, not just one thing. I, but no longer I: this is the formula of Christian life rooted in Baptism, the formula of the Resurrection within time. I, but no longer I: if we live in this way, we transform the world. It is a formula contrary to all ideologies of violence, it is a programme opposed to corruption and to the desire for power and possession. “I live and you will live also“, says Jesus in Saint John’s Gospel (14:19) to his disciples, that is, to us. We will live through our existential communion with him, through being taken up into him who is life itself. Eternal life, blessed immortality, we have not by ourselves or in ourselves, but through a relation – through existential communion with him who is Truth and Love and is therefore eternal: God himself. Simple indestructibility of the soul by itself could not give meaning to eternal life, it could not make it a true life. Life comes to us from being loved by him who is Life; it comes to us from living-with and loving-with him. I, but no longer I: this is the way of the Cross, the way that “crosses over” a life simply closed in on the I, thereby opening up the road towards true and lasting joy. Thus we can sing full of joy, together with the Church, in the words of the Exsultet: “Sing, choirs of angels . . . rejoice, O earth!” The Resurrection is a cosmic event, which includes heaven and earth and links them together. In the words of the Exsultet once again, we can proclaim: “Christ . . . who came back from the dead and shed his peaceful light on all mankind, your Son who lives and reigns for ever and ever”. Amen!